The Hawaii Superferry is setting sail tomorrow, two days earlier than planned, even though a court could scuttle it Monday. Fares: $5 a person one way, $5 a vehicle one way. Customers who booked more expensive fares for these dates will be refunded and given the cheaper fares. Schedule: Oahu to Maui, departs daily at 6:30 a.m.; Maui to Oahu, daily at 11 a.m.; Oahu to Kauai, Sunday through Friday at 3 p.m.; Kauai to Oahu, Sunday through Friday at 7 p.m.
Superferry officials announced plans yesterday to begin service from Oahu to Maui and Kauai starting at 6 a.m. tomorrow, at all-inclusive rates of just $5 per person and $5 per passenger vehicle. The inaugural fares last through Sept. 5 and are significantly below the normal fares. 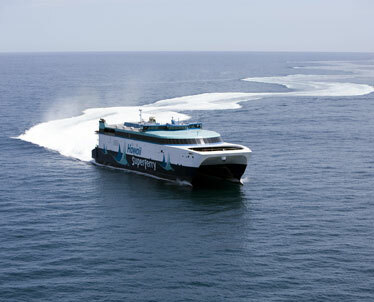 "We've been just chomping at the bit to get our service started as early as we can," said John Garibaldi, Superferry president and chief executive officer. "We're really happy that we've been able to accelerate the date." The launch, originally set for Tuesday, comes after the Hawaii Supreme Court ordered that the state prepare an environmental assessment for the Superferry facilities at Kahului Harbor. State Transportation Director Barry Fukunaga said an assessment will be done but added that the court's ruling does not prevent the ferry from operating. A spokesman for the preservation group Maui Tomorrow said the group plans to file for an injunction on Monday asking that the court halt the ferry service until the assessment is completed. "They're moving very quickly before anybody can stop them," said Ron Sturtz, Maui Tomorrow spokesman. With 300 employees and its four-story catamaran-style vessel ready to set sail, Hawaii Superferry officials plan to launch interisland service tomorrow, two days earlier than planned and one day ahead of a court challenge that could sink operations. Preservation groups on Maui had asked the company and the state to voluntarily suspend operations while an environmental assessment -- ordered Thursday by the Hawaii Supreme Court -- is prepared on the vessel's use of facilities at Kahului Harbor. Superferry officials instead moved up the launch date by two days to tomorrow and slashed fares to $5 per person and $5 per passenger vehicle for travel through Sept. 5. Customers who already purchased tickets would be refunded the difference. Base fares for adult passengers range from $52 to $62 per person. Vehicle fares for cars start at $59. Superferry President and Chief Executive Officer John Garibaldi said the early start was in response to the positive feedback the company has received in recent years, especially since the twin-hulled Alakai arrived in Hawaii. Garibaldi declined comment on the possibility that a court order could force the ferry back into port. "I don't want to speculate on any activities that may happen in the courtroom," he said. "We're confident that we'll be able to provide service going ahead." Critics of the Superferry say they plan to seek a court injunction Monday to halt operations. Based on a ruling Thursday by the Hawaii Supreme Court, Maui Circuit Judge Joseph Cardoza filed an order of summary judgment yesterday, requiring state transportation officials to prepare an environmental assessment for the Superferry facilities at Kahului Harbor. Ron Sturtz, spokesman for the environmental group Maui Tomorrow, said he was pleased with the promptness of Cardoza's response. "He has legally paved the way for us to proceed very quickly," Sturtz said. Sturtz said the launching of the Superferry violates state environmental law, arguing that an assessment should be completed before the service starts. State officials say they interpret the law differently. "This is not the first time it has been determined -- after improvements have been done -- that additional environmental studies should have been gone into," said Deputy Attorney General William Wynhoff. "We don't believe that from where things stand right now that we need to stop the project pending environmental review. We are complying with the law." State Transportation Director Barry Fukunaga said the ferry will be allowed to operate while an environmental assessment is conducted. "We felt very confident and strongly about the fact that what we were doing fell under the parameters of the law," Fukunaga said. "The issue of environmental harm is all speculative until we complete the environmental assessment." The assessment will determine what harm, if any, is being done to the environment, and officials would address the problem then, Fukunaga said. "If there's issues, those issues will be mitigated and we will go forward," Garibaldi said. "We'll work with the state and communities in mitigating any items that come up." Sturtz also called the Superferry's accelerated start date an attempt to bypass a separate order by Maui Circuit Court Judge Joel August on Thursday aimed at easing traffic problems envisioned by the use of the Superferry. Sturtz said August issued the order with the understanding from Superferry officials that the operations would begin Tuesday on Maui. "One would think the Judiciary would not be happy by this move," Sturtz said. August's ruling required repainting of road stripes at the intersection of Puunene and Kaahumanu avenues fronting the Kahului Harbor entrance. Transportation Department spokesman Scott Ishikawa said that work is expected to be completed by today. Work was not moved in response to the Superferry's decision to start service earlier, he said. The state planned to repaint the stripes tomorrow but was unable to find crews to do the work, Ishikawa said. Sturtz said he was not surprised that Gov. Linda Lingle's administration has refused to halt the Superferry's operation. "You have to understand there is a lot of politics and a lot of money behind this, and the Department of Transportation has been cooperating with the governor and Superferry from day one," he said. "They're not very respectful of the citizens of Maui, the courts or the legal process, in my opinion." Environmental observers say the state Office of Environmental Quality Control usually takes about three months to process an environmental assessment. The process involves the publication of the environmental assessment and a statement that the agency anticipates no significant environmental impact. A 30-day period is allowed after the publication of the notice for public comment on the environmental assessment. The agency building the project then usually submits a final environmental assessment, including the public comments and a letter saying it has determined a finding of no significant environmental impact. Asked about Maui Tomorrow's charge that the certificate issued by the state Public Utilities Commission was illegal, chief counsel Stacey Djou said the commission staff is "still considering the issue."